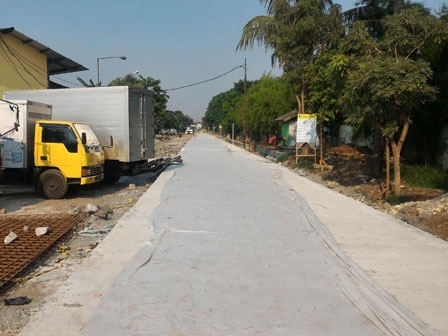 20 points of neighborhood roads that spread in Grogol Petamburan Sub-district were finally repaired by the ranks of West Jakarta Bina Marga Sub-dept.
" We do this to minimize puddles"
West Jakarta Bina Marga Sub-dept. Head, Riswan Efendi said, it was done as one of the anticipation of puddles in the surrounding environment. "We do this to minimize puddles. Thus water will flow into the lower channel and then continued to the next river," he stated, Wednesday (11/8). He added, some activities in 2017 APBD that is still under construction, among them is the arrangement of the sidewalk on Jalan Tanjung Duren Raya and Jalan Daan Mogot that spends Rp 229 billion. "We're optimistic it can be completed on target that falls in December 2017," he closed.